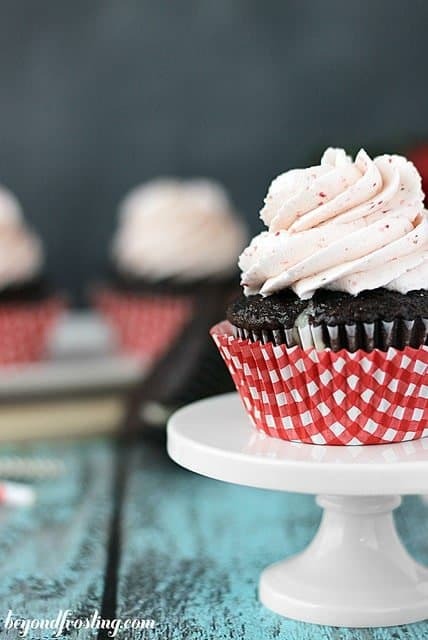 These red velvet cupcakes have a cheesecake filling and are topped with a silky chocolate cream cheese frosting. 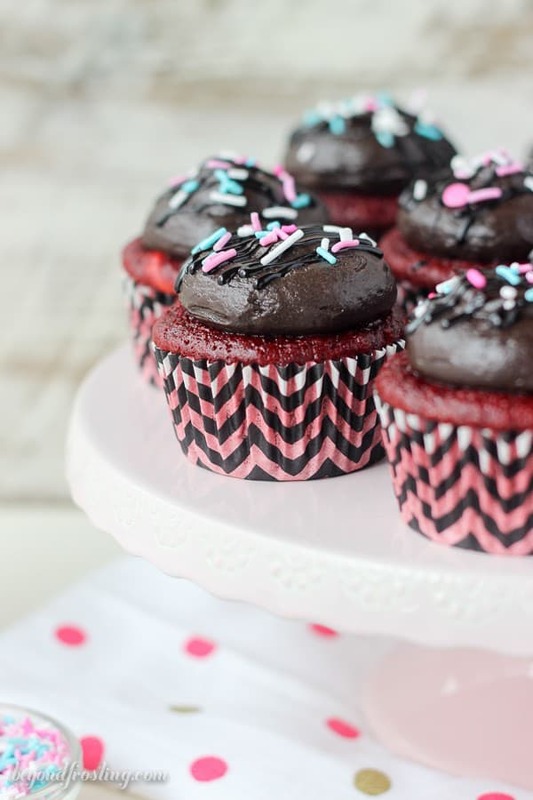 Rich and decadent, these cupcakes will satisfy your sweet tooth. Hey February, it’s nice to see you. I welcome your cheesy super bowl snacks and your chocolate covered strawberries with a side of roses. Finally we can return to our Sunday night episodes of The Walking Dead and I’m settling in nicey with my glass on wine in front of the TV on Thursday nights. Life is back to normal. I can make all the chocolate desserts I want because it’s February is national chocolate lovers month, and I don’t make the rules but I am pretty sure that means there’s no holding back. So, we’ll start with cupcakes. 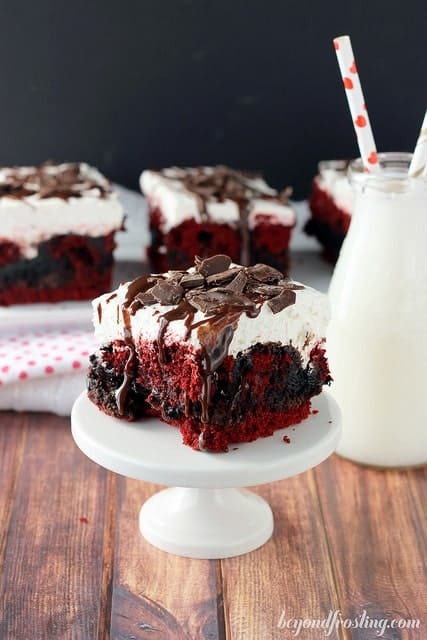 Red velvet and cream cheese are a classic combination. 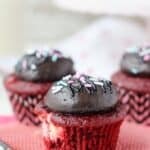 In these cupcakes you’ll find a baked cheesecake filling and also a chocolate cream cheese frosting. Whether it’s for Valentine’s day or just another Wednesday, these red velvet cupcakes are totally necessary. You could use a homemade red velvet cupcake if you prefer, but I reach for my handy box of cake mix. Then I made a quick and easy cheesecake filling. The filling is made with just 4 simple ingredients: cream cheese, an egg, granulated sugar and a hint of vanilla extract. The filling works best if the cream cheese is softened to room temperature. So you can either plan ahead and leave it out, or you can throw it in the microwave for 20-30 seconds. You just want the filling to be completely smooth before adding it to the cupcakes, so I always prefer to use a mixer instead of stirring by hand. If you only have one mixer, than you might consider making the filling first. I used about 1 tablespoon of the filling for each cupcake. Rather than a traditional cream cheese frosting, I decided to change it up. Nothing beats a chocolate cream cheese frosting, for REALS. Side note, cream cheese frosting is the BEST! Can we all agreed on that? This frosting is creamy with a silky finish. It’s sweet yet rich with a dark chocolate flavor. This frosting is best enjoyed at room temperature. If you need to make the frosting ahead of time, you can refrigerate just the frosting and then allow it to come to room temperature before actually frosting the cupcakes. I prefer not to refrigerate the cupcake because of the possibility that they will dry out. If you ask me, this is the best way to kick off the month of February because YOU deserve a cupcake. Put it on my tab. For the cupcakes: Preheat the oven to 350° F. Line a cupcake pan with cupcake liners. To soften cream cheese, remove the wrapper and microwave for 20 seconds, flip it over and microwave another 10 seconds. Mix together the softened cream cheese, sugar, egg and the vanilla extract and beat until smooth. Set aside. In a large mixing bowl, combine the cake mix with required ingredients listed on the back of the box: water, oil and eggs. 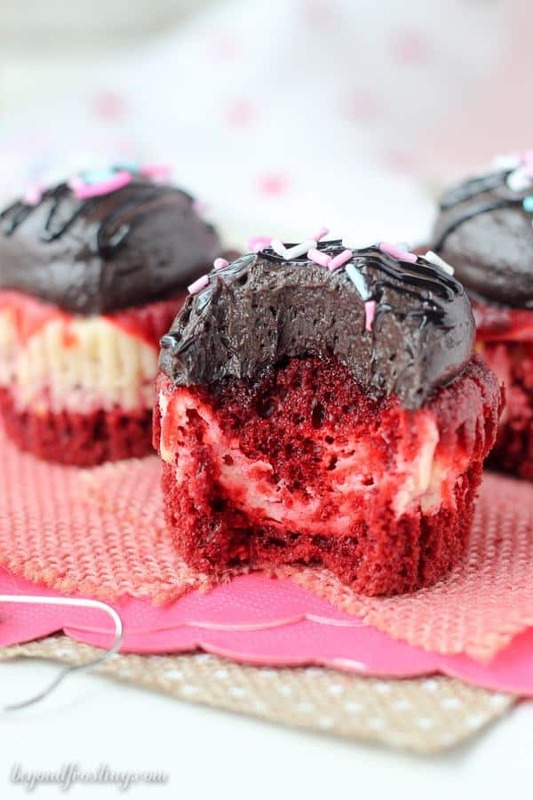 Spoon cupcake batter into liners. Fill your lined cupcake pan 1/3 full, covering the bottom of the liner. 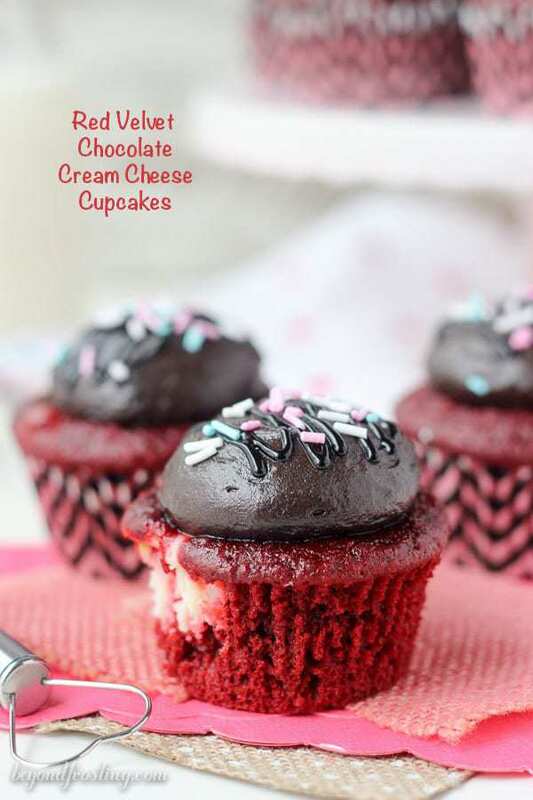 To add the cream cheese mixture to the cupcakes, use a tablespoon to drop into each liner. Use a knife or a toothpick to swirl it into the batter. Top it off with another scoop of the batter so the cupcake liner is 2/3 full. 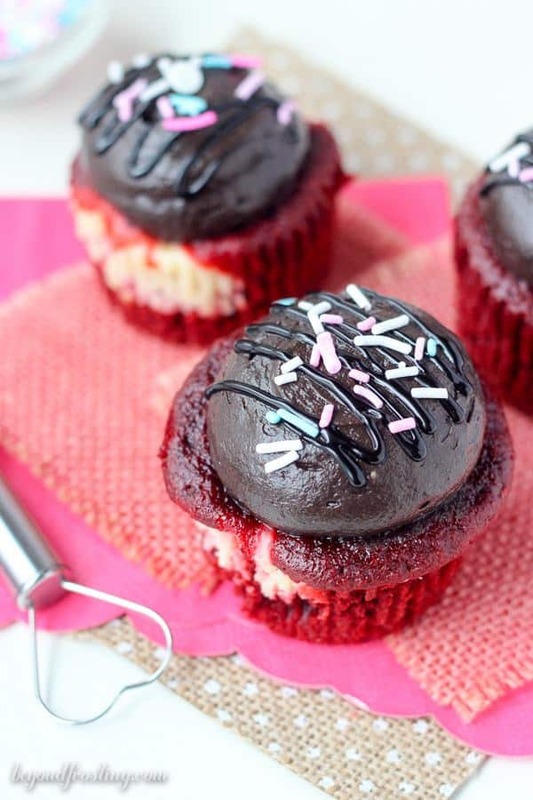 Bake the cupcakes at 350°F for 16-20 minutes. Use a toothpick to check the doneness of your cupcake. Insert the toothpick and if it comes out clean, your cupcakes are done. Allow cupcakes to cool for a couple minutes before transferring to a wire rack and then cool completely. For the frosting: Allow the butter and cream cheese to come to room temperature so they are soft but not melted. Beat the butter and cream cheese together in mixer on medium speed until smooth and creamy. Scrape down the bowl as needed. Slowly add the powdered sugar 1 cup at a time while continuing to beat on medium speed and then mix in the cocoa powder. Lastly, add the vanilla extract and the heavy whipping cream and continue beating on medium-high speed for another minute or two to whip some air into the frosting. Frost the cooled cupcakes with an open round tip, holding the piping bag over the top of the cupcake in the center and squeeze the bag forcing the frosting to spread to the edges of the cupcake. Gently swirl your hand and you pull the bag away. Top with sprinkles. This is not a very thick frosting, but it should not be running off your spatula. So adjust the amount of powdered sugar to your desired consistency. 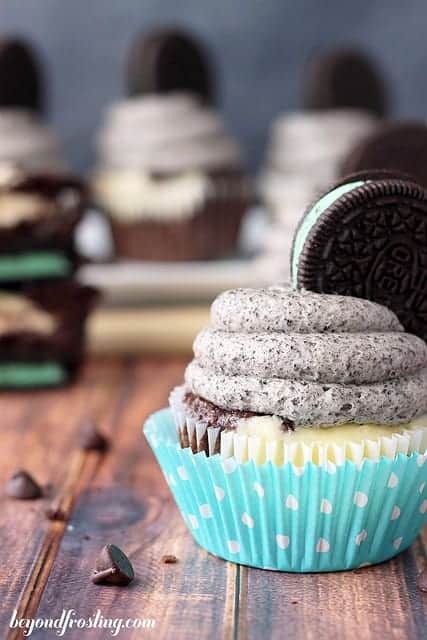 If you need to make the frosting in advance, go ahead and refrigerate, but then allow the frosting to come to room temperature before frosting the cupcakes. If these taste as delicious as they look….. well I’m a goner. Yum! How much red food coloring do you add to the cake mix? Hi Kim, there’s no red dye at all. I used a box of red velvet cake mix. Sorry for the mixup!